This Rakhi Season, gift your sweet brother this funky Kundan Biker Rakhi studded with Stones & Pearls on a Red Thread. 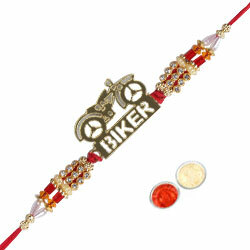 Well, your brother will be very excited to see such an amazing Biker Rakhi. Moreover, you will get complimentary Message Card, Roli Tika & Chawal.